What do your students think of the state of the union? Will they be watching on January 30 when President Trump takes the podium for one of the most-watched political events of the year? Help students discuss the issues, fact-check the speech and evaluate the arguments with these resources for bringing the State of the Union into your classroom, including the ever-popular State of the Union bingo! This year, Bay Area students will join KQED at The Mix at the San Francisco Public Library’s main branch to watch the speech and create media in response to what they hear from the president. The event is one of several media-making “break-a-thons” nationwide inspired by the 22×20 campaign, a national initiative promoting youth civic action. The name 22×20 refers to the 22 million teens who will be eligible to vote in the 2020 general election. Can’t join the break-a-thon in person? Here are some resources and ideas for bringing the State of the Union to your students and connecting them online to other young people during the speech. Get your students up to speed on the issues likely to be discussed on January 30. Start with The Lowdown’s advanced coverage of this year’s State of the Union, which includes a rundown of six key issues and the promised bingo card! This lesson plan gives ideas for preparing students to watch the speech live. It recommends students choose one issue they feel strongly about, then focus on that topic as they watch the speech. Film a response: Students can record their thoughts about the issues on our State of the Union grid on Flipgrid, a free video discussion platform. Fact-check: Students can fact-check statements about an issue they care about or monitor fact-checking sites, like Politifact, which will be posting live updates during the speech. 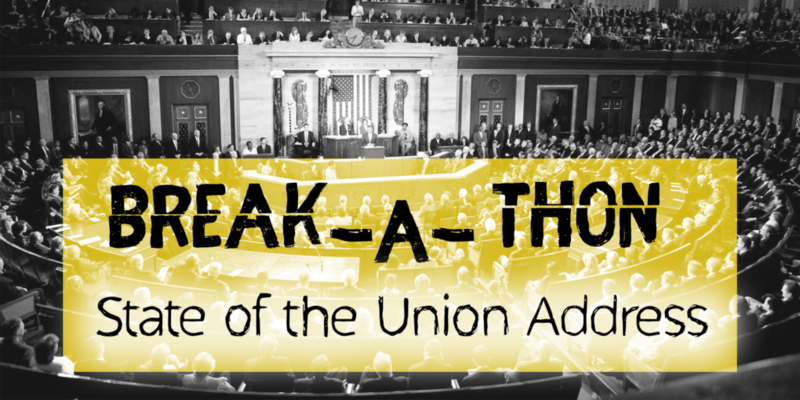 Make a meme: At KQED’s break-a-thon, we’ll be making memes related to issues that come up in the speech. Memes are short, visual statements that use well-known images to communicate an idea or opinion. Students can create memes using a number of free generators, then share their creations on social media and with the class the next day. Don’t forget the #22×20 hashtag! Democratic response: Remind students that a response by a Democrat will follow Trump’s speech. The party who is not currently occupying the White House typically gives a televised response in a tradition dating back to 1966. Students can also make memes, share online responses and fact-check the Democratic response. Debate and annotate: Discuss the speech and ask students to share what they learned about their chosen issue. The State of the Union transcript will be available shortly after the speech. To spur discussion and allow everyone to share their ideas, students can annotate the speech online as a class using hypothesis, a free web annotation tool. To learn more about online annotation, check out these resources on KQED Teach. Your own State of the Union: How would your students define the state of the union? What ideas do they have for steering the nation? Students write their own state of the union speeches, or add their ideas to the class’s collective speech. Then share the speeches on Flipgrid or in the comments of The Lowdown post. For more information about how your students and future voters can make their voices heard, check out KQED’s Local Election Toolkit and 22×20 campaign sponsored by The Lamp. Rachel Roberson is KQED's news education manager. Previously, she was a reading, writing and social studies teacher leader on three continents, having served on the founding staff of KIPP Bayview Academy in San Francisco before moving to schools in Abu Dhabi and Austin, Texas. She started her teaching career as a Peace Corps volunteer in Cameroon. Before she was a teacher, Rachel was a journalist in the East Bay.